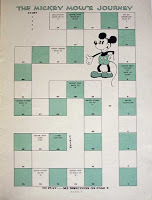 The first print appearance of Mickey Mouse (naturally besides posters and other publicity material of cartoons themselves) was with the daily newspaper strips which began in early 193o (An excellent web site covering to the earliest Mickey strips is at http://bobcat74.free.fr/mmds/plane/pln001.htm). 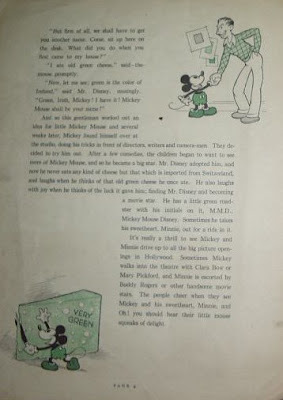 The first publication exclusively devoted to Mickey on the other hand was the Mickey Mouse Book published later the same year. 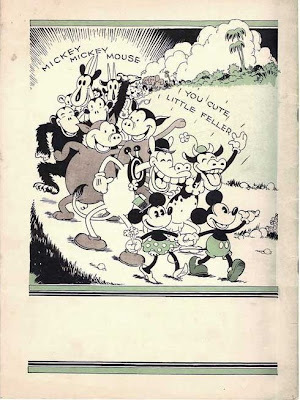 Vintage Disneyana collectibles expert David Lesjak's highly recommended blog had already covered this book in a post last year (http://vintagedisneymemorabilia.blogspot.com/2007/12/mickey-mouse-book.html), but I want to go over it again with a bit of additional detail and this time provide a complete run of scans. 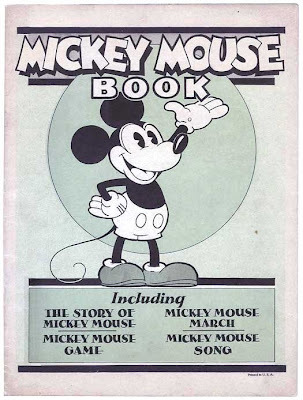 According to the collectors' guide Disneyana, this slim booklet was distributed to dimestores and often utilized as a give-away with toys; David says it was distributed to theaters to be used as a promotional item for the newly-founded Mickey Mouse Clubs. The contents are a 4-page illustrated story, several games and songs, as well as a few full-page illustrations. 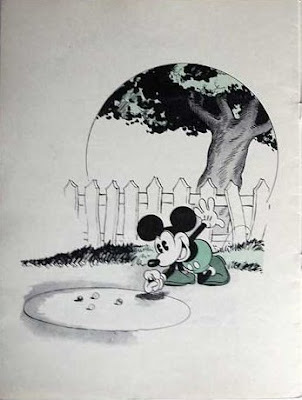 This story of Walt Disney's encounter with a little mouse in his house might have been an inspiration for Disney when he made up the highly popularized account that his inspiration for Mickey was a real mouse in his studio (see below post). 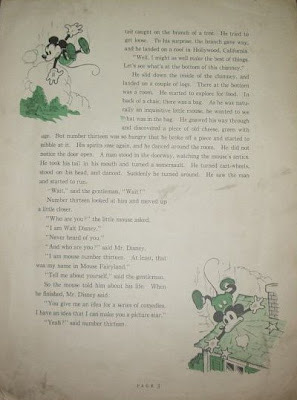 Subsequent editions of Mickey Mouse Book entailed some revisions. 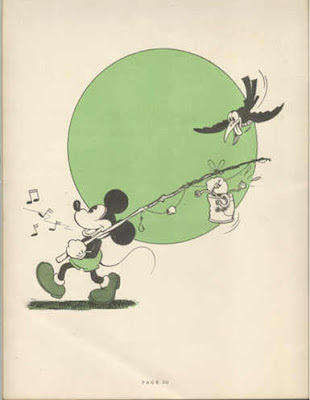 While the cover of the first edition had a light green background, later editions had a darker green tone. 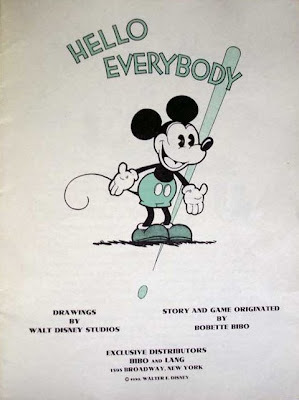 The age of Bobetto Bibo was added to the title-credits page. 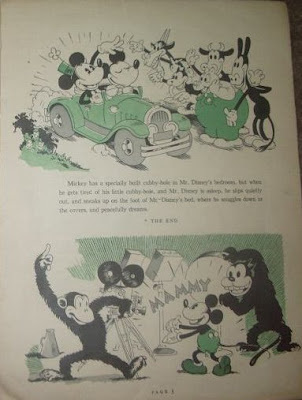 Two samples from the Mickey newspaper strips were added to page 8 and to the backcover. 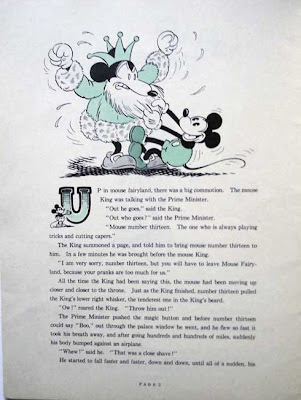 Last but not least, the lyrics of the song were re-written to censor the lines "When little Minnie's pursued by a big bad villain - We feel so bad then we're so glad when you up and kill". Thanks for showing these photos. 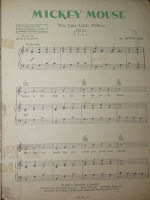 It is very interesting to see these pages - but it seems that the last page of the song is missing! Nice to have so many scans. Unfortunately, you give the impression that this is the complete book, but it is 20 pages long and you did not provide scans of all pages.